Hotcake or pancake is a world popular snack. Crêpe is a thin, round version of a pancake, popular in Europe. 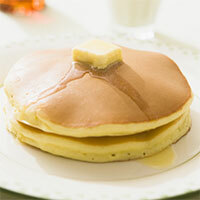 The American version of hotcake is made with a rising agent, mostly baking powder, so it is quite thicker than crepe. In America it is commonly eaten for breakfast. The ingredients are eggs, butter, milk, flour or pancake mix. Baking powder may be added according to the variant one wishes to make. The filling may be anything, from chocolate spreads and jam to cream cheese. Hotcake is not really a recommended snack for someone dieting, as it has very high levels of fat and carbs. The calories in Pancake per 242g(2 slices) is 644 calories. Pancake is calculated to be 266Cal per 100 grams making 80Cal equivalent to 30.08g with 101.33g of mostly carbohydrates、20.21g of fat、14.86g of protein in 242g while being rich in vitamins and minerals such as Molybdenum and Selenium.